Tired of the sub-zero temperatures and shoveling snow? Take a mental break and journey along with me through the hot, humid jungle. Wake up to freshly brewed Costa Rican coffee. Stroll along the emerald green ocean beach. Inhale the honey and vanilla scented tropical orchids. Watch as a scarlet macaw flashes by and listen to the booming howler monkeys. Enjoy a few minutes with Costa Ricans, the people National Geographic Magazine deemed as one of the happiest in the world. Costa Ricans stay active and live longer, partly, I believe, because they spend a great deal of time in nature and embrace a Pura Vida philosophy. This national mantra, translated as “Pure Life” or “Simple Life,” is all about seeing every experience as a gift. On the last day of our Costa Rican trip, my tour guide, Eduardo, in keeping with the Pura Vida philosophy, asked me what I’d most enjoyed. My mind immediately flashed to crossing the suspension bridges through the jungle (see last week’s column) but it quickly flitted to today’s activity which was equally as appealing. While hiking through Manuel Antonio National Park, we’d come face to face with animals I’d only seen before in zoos—two agoutis (large guinea-pig type mammals) and a raccoon-like animal called a coati. After hiking for several miles, we peeled down to our swimsuits and waded into the quiet Pacific Ocean bay. The sand was tan, not as dark as the sand we’d seen closer to the active volcano. The water was clear and the waves gentle. Was this what I’d most enjoyed? Maybe I should answer that our early morning bird watching excursion where I’d spotted my first roseate spoonbill, toucan, and cherry tanager was my favorite. Or should I reply that it had been when we’d soaked in the volcano-heated hot springs? Eduardo was still waiting. I might answer that I’d most appreciated seeing the “real” Costa Rica.” This included viewing a mixture of wealthy and poor communities where homes and cars (if the people were fortunate enough to own cars since the high import tax about doubles the price) were often locked inside fences strewn with ominous looking concertina wire. Even though crime is a concern in Costa Rica, I felt safe, especially because I was with a savvy tour group. More surprises included the following. Motorcyclists squeezed into the smallest spaces on already narrow roads and zipped past, even on curves with “no passing” signs. Police officers receive low pay and although we drove 1,000 miles, I only saw a handful of cars pulled over. Since I don’t speak Spanish, I was happy to learn many Costa Ricans speak English. Costa Rica prides itself on sustainability and runs on 100% renewable energy. “Amy?” Eduardo peered at me anxiously. I needed to answer. A howler monkey whooped in the distance. Another howler called back, and I knew my reply. “A highlight was your calling in the monkeys,” I said. Eduardo laughed. I could see by his expression that he was remembering the moment too. On our third day a troop including a female with a baby had perched in the branches of a tree. The largest monkey, one of the males, howled. “Watch this,” Eduardo had said. He cupped his hands, hunched his shoulders in monkey fashion, and howled fiercely. I had focused my binoculars on the largest howler which looked to be the size of my Cockapoo or about 20 pounds. The howler turned his head and stared Eduardo down. Then he howled back in what was obviously a “One-step-closer-and-you’re-buzzard-meat” answer. The hairs on the back of my neck had risen, and I’d pictured the howler coming down to attack. I’d read that the males are so territorial that if the females leave their male offspring unprotected, the dominant males will kill them. Howlers also have an effective strategy to keep bothersome people away—they pee on them. We packed up our gear and hiked back to the park entrance. On the way, I heard a troop of howlers. Even though I’m willing to embrace the Pura Vida philosophy and accept the bad along with the good, I remembered what they did to bothersome people and didn’t walk directly under their tree. 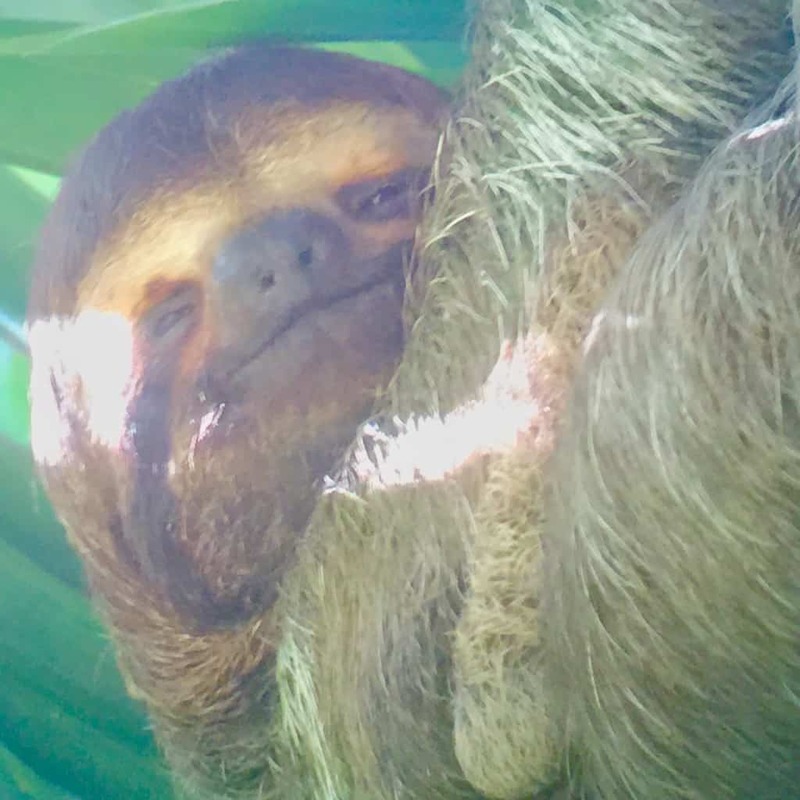 Just before leaving the park, a new friend I’d gotten to know spotted a sloth and took its picture. I focused my binoculars for a final time. Look at that. It’s smiling.